Jimmy Carter Man From Plains is not a conventional Presidential biography, despite having Jimmy Carter as its subject. The documentary has a much narrower focus, following Carters 2006 book tour in support of his controversially titled tome Palestine: Peace, Not Apartheid. The ex-president comes across as smart, thoughtful and entirely dedicated to his role as an elder statesman with an obligation to bring global injustices to light. Much of the film takes place in radio and television stations across the U.S., where Mr. Carter is subjected to endless interrogations on his title choice and the perceived bias behind it, often by interviewers that have clearly not read the book past the title page. 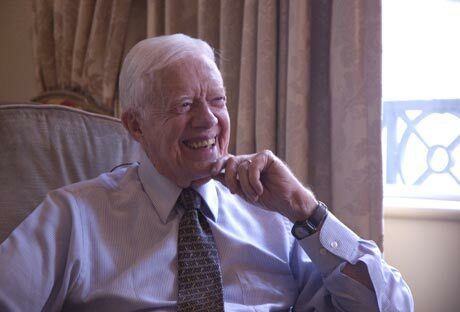 The film sticks mostly to the roots of Carters interest and work in the Middle East, with an extended segment about his role in brokering the peace treaty between Israel and Egypt (for which he won a Nobel Peace Prize). It delves into his personal life only to mention the profound influence of his mother, a Peace Corps nurse, and the strength of his marriage to Rosalynn. Director Jonathan Demme, best known for helming Hollywood fictions such as The Silence of the Lambs and Philadelphia, is no stranger to the documentary genre, having made numerous music-inspired films (Stop Making Sense, Neil Young: Heart of Gold), as well as the recent political documentary The Agronomist. His style is artful and intimate, shooting Carter in extreme close-ups with such unfettered access that it suggests a close and easy relationship between filmmaker and subject.